A graduate of Leadership Plano, Trustee Menon has received endorsements and support from several prominent members across the political spectrum, throughout Collin County. Dr. Menon’s previous volunteer and board experience includes service as a trustee of the Medical City Plano and Medical City Frisco hospitals, Chair of the Plano Symphony Orchestra Board, Atlantic Housing Foundation Board in Dallas and as a founding President and board member of the 600+ member IIT Alumni Association of North Texas. He has also been active in the community through The University of Texas at Dallas Eric Johnson School of Engineering and Computer Science Advisory Board, Leadership Plano Executive Board, and the Preston Green Homeowners Association. He has served on several committees with the Plano Independent School District, including the Plano ISD Academy Visioning Committee, the 2016 Plano ISD Facilities and Technology Task Force, several PTA organizations, and has also served as Chair of the Plano ISD Diversity Advisory Committee. He has been on several PTA/PTSA Boards and is also a recipient of the Texas PTA Life Membership. We know you will see friends and neighbors among his supporters across Collin County. 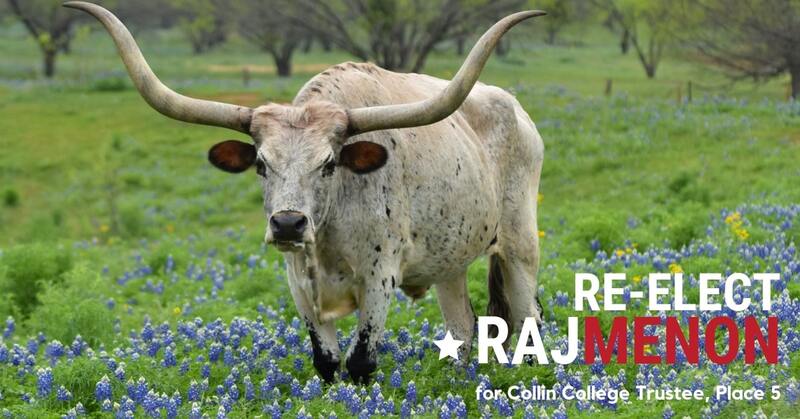 Now is the time for you to endorse Dr. Raj Menon for Collin College Trustee, Place 5 and show your support. 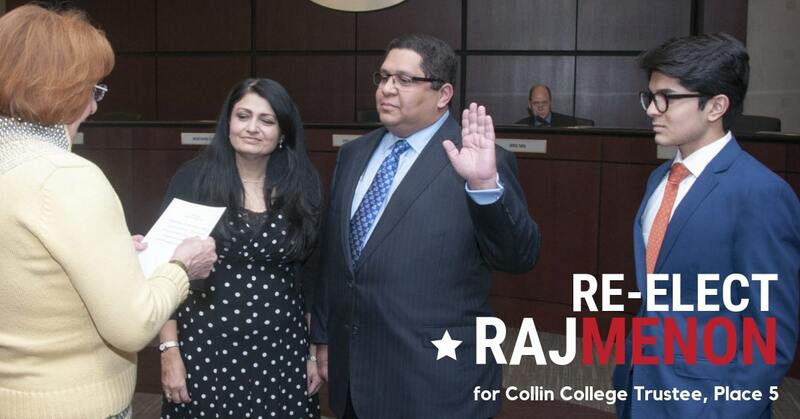 Trustee Raj Menon will continue to provide thoughtful leadership to Collin College to ensure a quality, affordable education. Please vote for him. 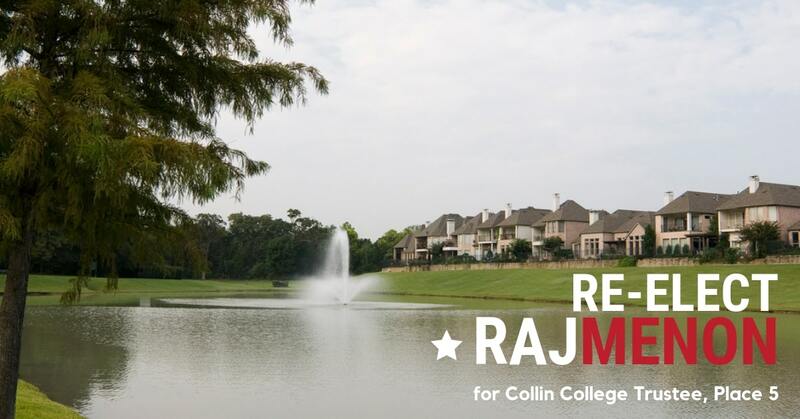 Raj is truly committed to our community and we feel so blessed that Raj is now a steward of Collin College. Please consider supporting his candidacy, voting for him on May 6. It is commendable when folks give back of their time and energies especially to impact education. Thank you Raj for all that you do and we wish you continued success! 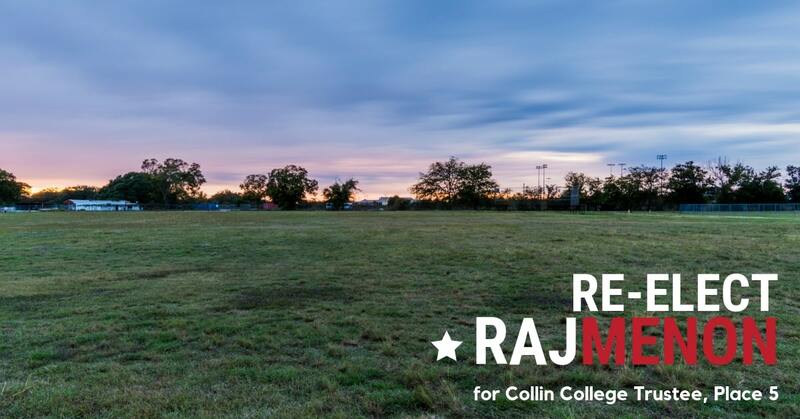 …I cannot think of anyone else who would serve Collin College, the students or community better than my dear friend Raj. Vote for Raj! I have known Raj Menon for many years. A business leader, he is also passionate about serving the community.